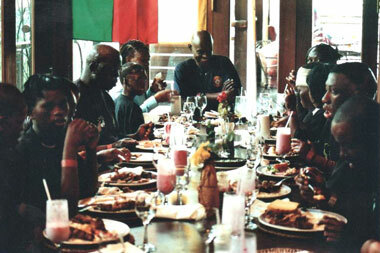 These are just some of those who have sought our help across Africa. 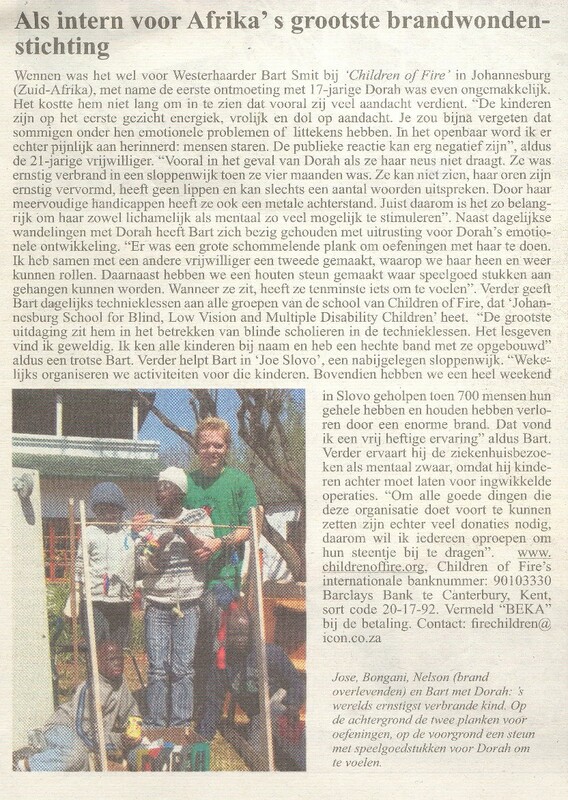 On 7th September 2011 the story of Bart Smit, a Dutch volunteer helping at Children of Fire and at its sister charity the school, was published in a newspaper called De Sallander/De Veenstreek. Some 33 thousand copies of the free newspaper are distributed in the towns of Hardenberg, Langeveen, Aadorp, Den Ham and the small villages in between, in the Netherlands. 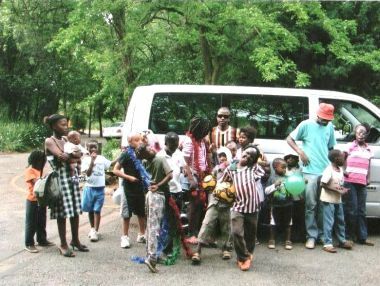 Actors: Mortain Dube, Mitta Lebaka, Michael Wessels, Amanda Simanga, Sicelo Maduna, Londeka Ngidi, Abegail Ximba, Thulani Nhleko, all UMashesha volunteers from Children of Fire, performed a safety play in Alexandra Township on Monday 21st February 2011 at the Ithute Primary School. More plays were scheduled to follow in coming weeks. The main theme of the play was about the dangers of falling candles and all that that can entail if a safe holder is not used. 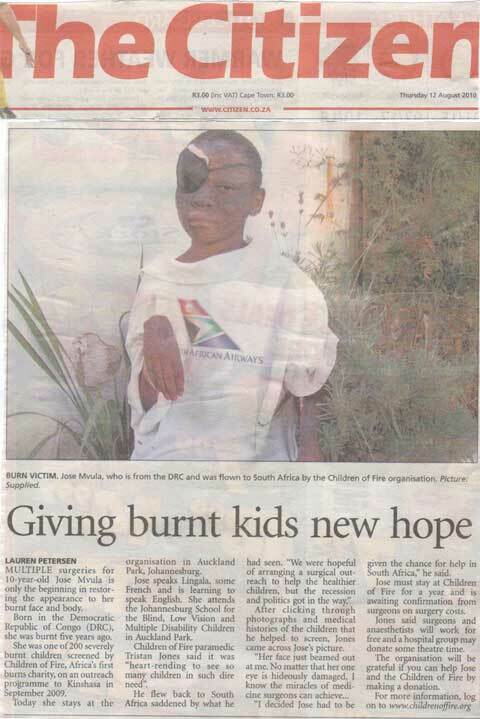 All the more poignant was the fact that Sicelo Maduna (12) is the survivor of a blaze caused by a falling candle. He was badly burned at the age on one month old, but survived against the odds, despite losing an arm and the use of an eye. Three other burns survivors were in the cast - Amanda survived an arson attack, Thulani survived a veldt fire, and Londeka survived hot liquid burns. Londeka Ngidi said: "Some of us cannot remember when we were injured, because we were too young when it happened. But none of us forget how getting burned changes your life forever. We would do anything to save other children from the pain of the injury, and from the teasing that goes with scars." 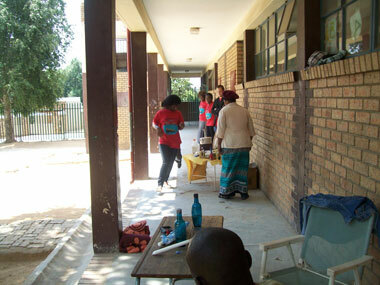 On Saturday 5th February 2011, volunteers Katarzyna Pawelczyk, Mitta Lebaka, Thulani Nhleko and Feleng Mahamotse shared toys with all the children in the paediatric ward at Odi Hospital near Pretoria. 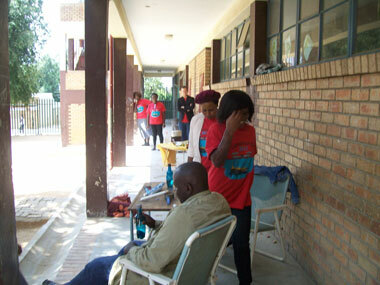 Odi was the hospital where one of our younger burns survivors Seiso was admitted several years previously. 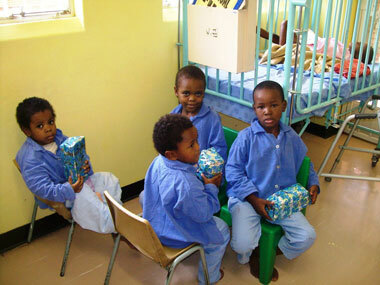 Thanks to our kind donors for the toys. 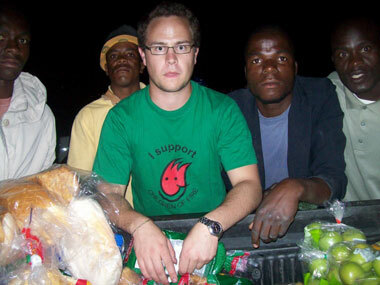 After five hours in Home Affairs trying to sort documentation for some of our kids, then Children of Fire UMashesha (quick mover volunteer) Michael Wessels set off to acquire the food for Kya Sands fire survivors (60 families) and to deliver it, working well into the night. 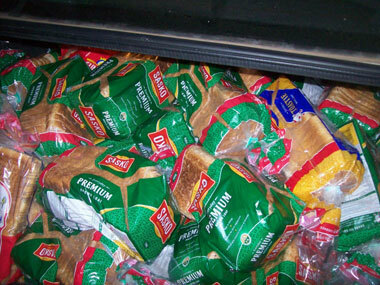 The help of Pick n Pay and other donors is appreciated. 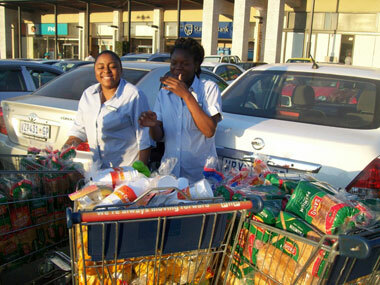 The recipients of the food were very happy to be helped. 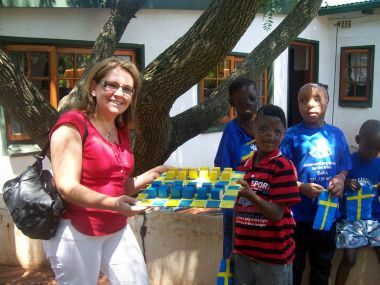 Miriam Duvell Zetterlind accepted a tactile checkers game made in Swedish colours from Feleng Mahamotse (8), as Children of Fire's gift to Saab. Each square was outlined in wool so that a blind child can play the game as well. In the background Sicelo, Sizwe and Nhlanhla. Sitting by the sandpit with Saab's engineer Nico and Human Resources manager Brenda Talazo: Doreen, Dorah, Obvious, Sandiso, Obvious, Mabontle, Make, Boipelo, Nkululeko, Thapelo, and one child exiting right! 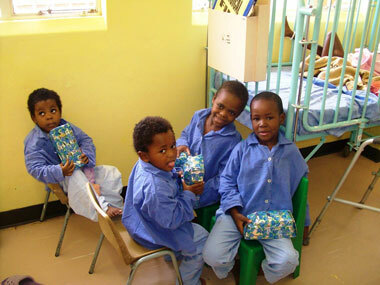 Brenda Talazo with Nkululeko (9), Sicelo (11) and Sizwe (9) with thank you paintings by the children. 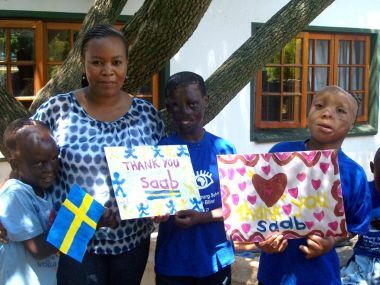 She's the unofficial patron saint of burn victims in South Africa and she's no stranger to controversy. Bronwen Jones is prepared to fight fire with fire to save lives. Trish Beaver discovers more about this unorthodox firebrand. The problem with Bronwen is that she doesn't know the meaning of the word "NO". So when she encounters an obstacle she simply finds a way around it, over it, or she chips away at it until it disintegrates. This can be a bit frightening for those who encounter her for the first time. It can be a bit like meeting a bulldozer face to face in a one way street. But there is another side to Bronwen Jones. She has a heart that is full to overflowing and a quirky smile and laugh that brightens a room. Her silky English rose complexion that makes you wonder why on earth she is here in the heat of Africa fighting proverbial veld fires. Perhaps it's a question she herself doesn't quite know the answer to. Her life is like a runaway veld fire, one day it ignited and swept her away in this direction. Dressed as always in casual jeans, her hair in a ponytail or in plaits, Bronwen looks far younger than she is. In her 40-odd years, she has done many things before settling on her latest passion as a fire fighter with a difference. She has edited newspapers, taught English to the Turkish military, worked at a pub, walked the streets wearing billboards advertising an antique market while she was living in St-Nicholas-on-Wade in Kent, England, and she even wrote a book on the famous underground tunnel linking Britain and France. She is actually a qualified engineering geologist. Her habit of breaking the rules reared its head at an early age when she decided to overcome the school rule that said that you had to be 11 to join the school orchestra. She took baby foxes to school in her blazer pocket and taught them how to eat eels from a bowl and strawberries out of season. Bronwen said: "My mother gave us a choice we could help in the house or in the garden and I much preferred the garden, which explains why I can barely cook an egg today but I can use a hammer and nails." 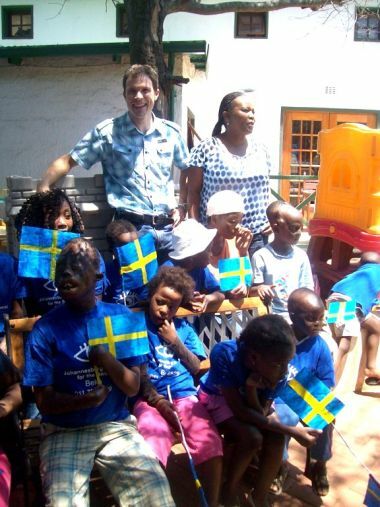 She came to South Africa 11 years ago, with her ex-husband Peter, expecting to stay for a few years. 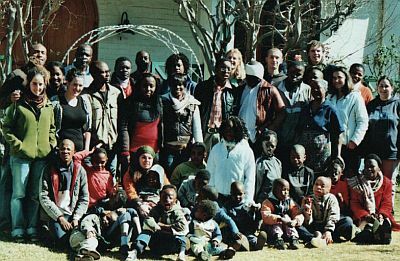 Bronwen was aware of South Africa's bizarre apartheid politics and she expected the newly "liberated" country to be challenging. But never did she imagine that she would be challenged at every turn and that her life would be turned upside down as she as became an activist for fire victims. She has had death threats, she has single-handedly waged war against city councils. She has marched into squatter camps in the dead of night with bags of clothes and food for the needy after fire has ravaged razed their shacks to the ground. In response she has demanded fire and first aid training for communities and every morning she wakes up with an endless "to do" list. When her ex-husband complained that she was taking their son Tristan (11) to dangerous places, she simply bought the boy a bullet-proof vest. She believes that the squatter communities respect the work she is doing and that she has to outsmart the thugs. "Ordinary people in squatter camps live with intimidation every day. When they have a blanket stolen they have to report it to the police who hardly take it seriously. "But to them it's is as serious as me having my car stolen. They will be cold all night. I believe in people fighting for their rights and being treated with dignity." It's not surprising that her family has a history of political involvement in the British political system. Bronwen describes herself as a "humanist". "Basically I hate to see people with education taking advantage of those who have none." She thrives on adrenaline and a wry sense of humour, being bossy is part of her modus operandi, but it's her ability to roll with the punches that that keeps her going when the times get tough. 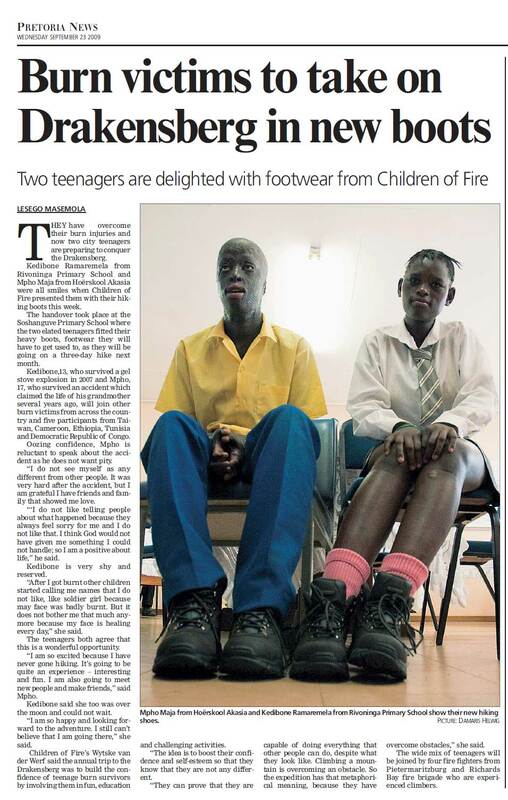 In 1995 an article about a baby who had been badly burned in a shack fire caught her eye. She went to visit the baby and she met infant Dorah Mokoena. Doctors were astounded that she had survived the fire and was continuing to cling tenaciously to life. Dorah survived - probably thanks to Bronwen. 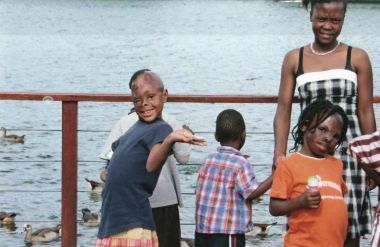 She managed to raise funds to get Dorah some reconstructive surgery. She now has lips, a prosthetic nose and a device she uses to hold things. She has partial vision but battles to communicate because her lips and tongue are affected. Today, Dorah lives with Bronwen and Tristan. She is the reason that Bronwen became immersed in the world of fire. She was appalled at the lack of facilities for burn victims and the lack of fire education among poor communities. 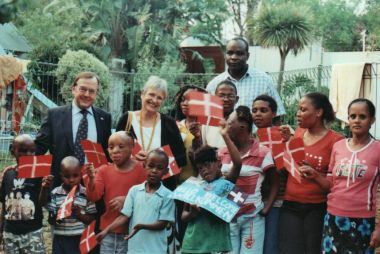 "Having newspaper connections in Britain I believed I could raise funds from overseas to help badly burned children get the surgical help they needed to improve their quality of life." 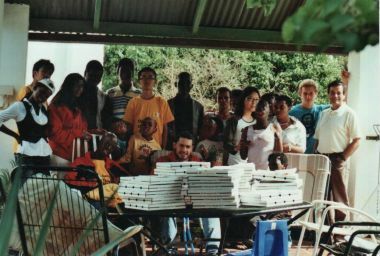 She set up the Children of Fire charity, which raises funds for badly burned children and then she began educating communities. 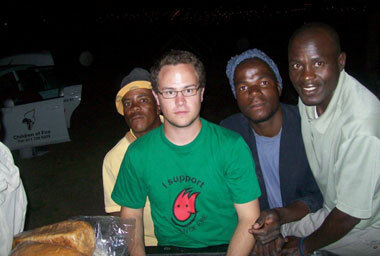 South Africa's informal communities are the most vulnerable where fire and injury is concerned. She said: "One fire can spread rapidly in a squatter camp due to the close proximity of the shacks and the lack of available water. "You soon learn that contributing factors are things like alcohol abuse - as many as one third of fire related injuries are intentional in South Africa." she explained. 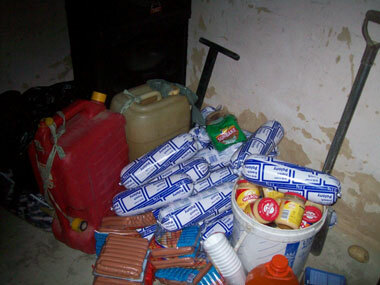 Fire can happen anytime among the poor who rely on candles, paraffin for heat and light. All it takes is a candle to fall over and a blaze begins, spreading like a ravenous monster eating everything in its path. "In many cases, it's the children who die, locked inside, unable to get out. The emergency services get there too late." Bronwen believes that the survivors are often worse off because their injuries leave them sentenced to a life-time of prejudice. "Victims are left horribly scarred and we live in a society where physical beauty is prized above anything else." Her most recent success has been the initiation of Umashesha "the Quick Movers", a project initiated in Johannesburg's Alexandra township to train volunteers in first aid and fire fighting. 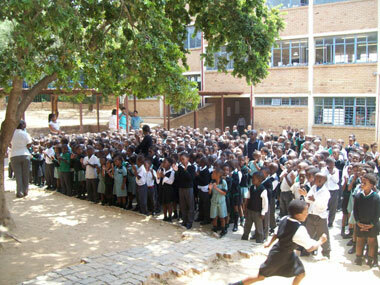 They have been identified as youth leaders and they undergo training with St John's Ambulance and Children of Fire. After training they are identified as "Umashesha" and are given stickers to stick on the doors of their homes and bright red t-shirts which identify them among the community. In any emergency the community know they can come to these people for assistance. The volunteers also act as a watchdog body looking for potential situations that could cause danger. Once they discovered a few illegal electricity connections, which they reported to the Johannesburg Electricity Department. These illegal connections are extremely dangerous. The volunteers also discovered that a fire extinguisher vandalised by scrap metal thieves had been the main reason a fire had spread causing 56 shacks to burn. 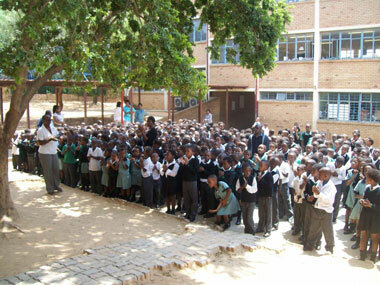 The volunteers recently focused on organising talks at Alexandra schools to make children more safety conscious in relation to fire. Bronwen is constantly canvassing companies looking for sponsorship for specially designed water tanks to install in squatter communities. Even in these instances she has to be creative and forward thinking. With water in such scarce supply, squatters may be tempted to raid the tanks for domestic water purposes, so plans were discussed to dye the water and treat it with something that tasted horrible. Bronwen is a realist when it comes to human nature. "I started learning about the dangers of fire and that was the beginning, I have learnt about people, cultures, communities, politics and all kinds of things I never imagined." She is eventually hoping that the Government will realise that her fire prevention measures can save lives and money in the long term and they will fund her education campaigns. But her association with the Government has not always been smooth. Once, in typical Bronwen style she did battle with South Africa's Department of Home Affairs. Her residence permit had not been approved and they had revoked her ex-husband's work permit. She faced the prospect of having to return to Britain. 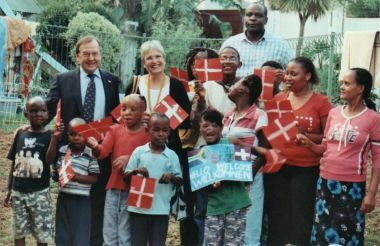 Bronwen donned her traditional Zulu outfit, booked plane tickets for herself and young Tristan and sat in the office of Zulu traditionalist Mangosuthu Buthelezi's who is minister of that portfolio, causing a minor riot as she handed out posters of burn victims and lectured the young secretaries until finally Water and Forestry Minister Ronnie Kasrils passed by, coming to her rescue. She recalls: "Buthelezi's flustered secretary told me I didn't have an appointment, and I told her that I had phoned her to say I was coming which was as good as an appointment." Bronwen has no regrets. She says flippantly: "If I meet a tall handsome rich plastic surgeon who can fix up all my burns cases and take me out to dinner then I'll be very happy won't I." 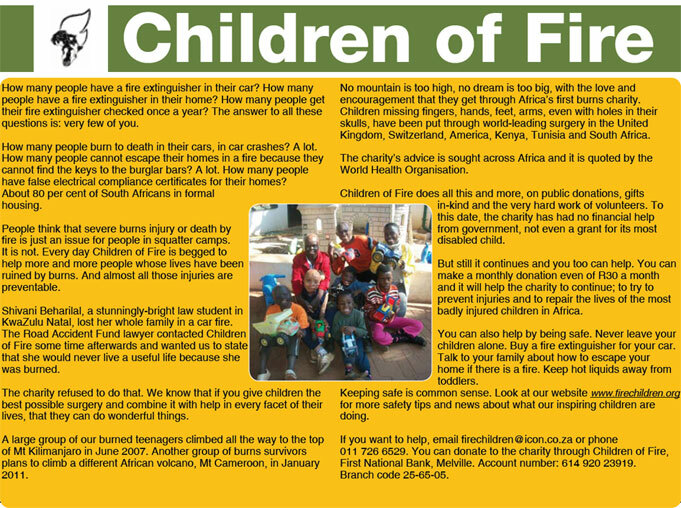 Her organisation can be found on the web - www.icon.co.za/~firechildren.